Century Packaging Ltd. has been providing customers with quality plastic packaging since 1994. 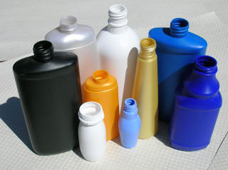 We take great pride in producing quality bottles in PET and HDPE in a range of sizes from 1oz to 4 ltr. All our production methods use state-of-the-art extrusion blow molding and reheat stretch blow molding machines made in either the U.S. or Canada. The bottles, jars and containers we create are used all over the North America for numerous products and industries including: Food, Beverage, Pharmaceutical, Cosmetics, Petroleum, Domestic Cleaners and Personal Care. With over 100 clients in the household and commercial sectors, our work can be found in stores all over North America. The first part of our process is to work with our customers to understand their packaging needs. A production consultant will discuss with you to determine if an existing mould can be used or if a custom design is needed. Clients will then be presented with multiple options to choose from which will include size of mold and type of plastic and colour, if needed. Once specifications for the project have been determined, and a mold made or provided, technicians use this information to create samples for client approval. After approval and sign-off, the production process can begin. Century Packaging Ltd. uses state-of-the-art extrusion blow molding and reheat stretch blow molding machines. 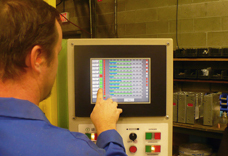 Our experienced technicians set up each machine according to our customer's specifications. This set up includes installing the specified mold, plastic and colour. Our plastic products come to us in the form of tiny pellets. These pellets are fed into the blow molding machines using a sophisticated vacuum system. In an extruder, heat is introduced and the pellets are melted and mixed with a desired color if needed. 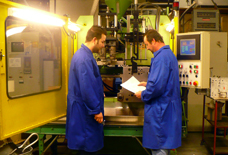 Once blended, the machines extrudes the plastic in to a suitable sized parison required for the mold to capture and continue the blow moulding process. Next, the mold closes on the parison and uses air pressure to blow it into the shape of the mold and holds the plastic against the water cooled mold cavity to solidify and cool the plastic to the final shape. Once complete, the machine releases the newly formed bottle onto a conveyor destined for the finishing area. 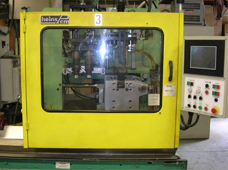 Reheat stretch blow molding starts with what is called a "preform" with a specific weight and neck finish. Once a preform and mold are selected and installed in the machine the preform is loaded in the machine and transported to a infrared oven, which heats the preform to the desired temperature. Then the preform is transported to the mold where the mold closes on the perform and a stretch rod stretches the perform. At the same time, high pressure air is introduced to stretch the preform to the shape of the mold and holds the plastic against the water cooled mold cavity to solidify and cool the plastic to the final shape. Once complete, the machine releases the newly formed bottle onto a conveyor destined for packing. This step is the most important to us. 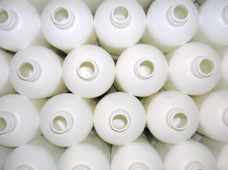 Even after a perfect molding process some bottles can have extra plastic or imperfections. The finishing area is where each bottle is examined by hand and trimmed of excess plastic if needed. 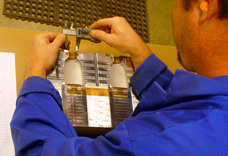 All of Century Packaging�s technicians are educated and trained to carefully inspect for any flaws that may occur during production as well as insuring machinery is always running at optimum performance levels. Environmental note: All excess plastics left after production is ground up and recycled to be used again. Century Packaging Ltd does not use any plastic containing BPA (Bisphenol A). 103-2555 Ross Road, West Kelowna, BC, Canada V1Z 1M2 � PHONE: 250-769-0136 FAX: 250-769-0123 ©2008 Century Packaging Ltd.